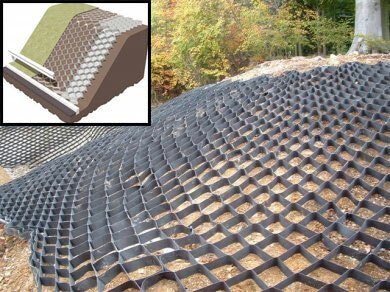 In areas where erosion control is required Typar Geocells are an excellent solution. Designed for both residential or commercial applications, a variety of different models are available to suit you specific application. Designed for both small residential and large commercial projects Typar manufactures a full line of professional erosion control products which are designed for a variety of different settings and applications. For information on additional Typar products for your specific application feel free to contact us. This system uses the strength and absorbent abilities of TYPAR Geotextiles to form a 3-Dimensional cellular confinement system. 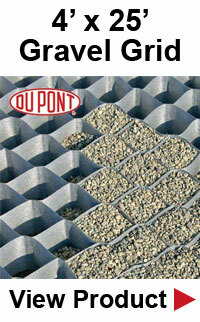 The GS Cellular Confinement System is made from dark gray PP/PE bicomponent fiber geotextile. The cell walls are absorbent to water, air, and nutrients which increase stability and fertile performance. This system is shipped in compacted panels that expand into a honeycomb structure to the desired shape and dimension needed on the site. Its unique, lightweight, and flexible material adjusts to various surfaces for easier installation and will also resist any impact damage. You may use different infill materials such as soils and recycled materials such as sand, gravel, and pebbles; to provide the reduction in waste and save on construction costs. The battle to prevent flooding runs into the millions of dollars in construction or temporary dam raising. If flood waters are not properly contained, it can lead to loss of life, millions of dollars from property damage, and the incalculable toll on everyone's livelihoods. Although the most common practice for controlling floods are the use of sandbags. The cell structure has many advantages over sandbags. Filling sandbags take a great deal of time and energy. Workers become easily tired and terrible choices must be made to decide which areas will be protected and which won't. Less labor is required than filling and stacking sandbags because earth-moving machines can fill the cells with sand very quickly. Also, the cells are constructed as a vertical wall, where sandbags must be stacked similar to the shape of a pyramid, and great deal more sand will be needed. Eeasy to construct, these cells are lightweight, are very rugged and exceptionally strong to withstand different levels of water volumes. The units can be carried by hand and brought in on equipment or dropped from helicopters without causing any damage. You can store the units out of the sun for years without deteriorating and will resist mildew and pests. These units are very effective as flood control barriers and for levee construction; both rising and repairing. These walls are an all-textile cellular containment system used for constructing structures from earth, sand, and other materials. When filled with sand or earth, the cell wall has no metal or plastic components, making it perfect for use at gun clubs. Fire range walls have ricochet hazards that need to be addressed for the reduction or elimination of these dangers. TYPAR GeoCell is the ultimate solution for the construction of small arms and close-quartered battle ranges. It will allow for a realistic, close quartered battle training with high-velocity weapons. It provides internal wall protection for multiple teams within the complex. It's also a very effective solution to add needed height on existing range wall berms, the addition of range dividing walls, obstacles and target protection. Water can erode top soils, wash away priceless plantings, pollute downstream and create enormous gullies. Even though these are regulated issues, current erosion control products can become overwhelmed by the soil and water that they are supposed to prevent. 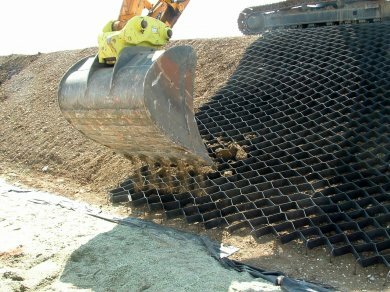 The heavy-duty geotextile fabric of these units adapt to the terrain while providing excellent structural durability and strength. As a matter of fact, the easy to construct cellular confinement system is perfectly suited for irregular terrain including slopes, in order to reduce erosion while promoting vegetation. These systems are also cost efficient as you can use mulch or fill from the site. 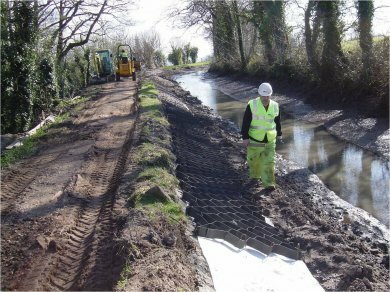 Water filters through the system while fill materials and soil particles are kept back by the geotextile. Once the erosion and sediment issues are gone, the cells can be emptied and used again, saving a great deal of money. These cells are extremely effective against mud slides and a perfect solution as debris flow barrier. • Erosion control on slopes and channels. There is a growing demand for domestic fuel production which has increased fracking and clean coal production. This has resulted in more stringent regulations on slurry and waste water byproducts to protect against spills and contamination. TYPAR GeoCells also offer a secondary confinement solution to create a much higher containment site while providing the ability of recycling fill material. This has proven to be very effectual. Reducing a site's footprint is critical to mining areas where elevation changes and topographic relief to minimize environmental impacts and costs. Using cellular confinement technology can drastically reduce the cut and fill needed to level a site while improving the return on investment.